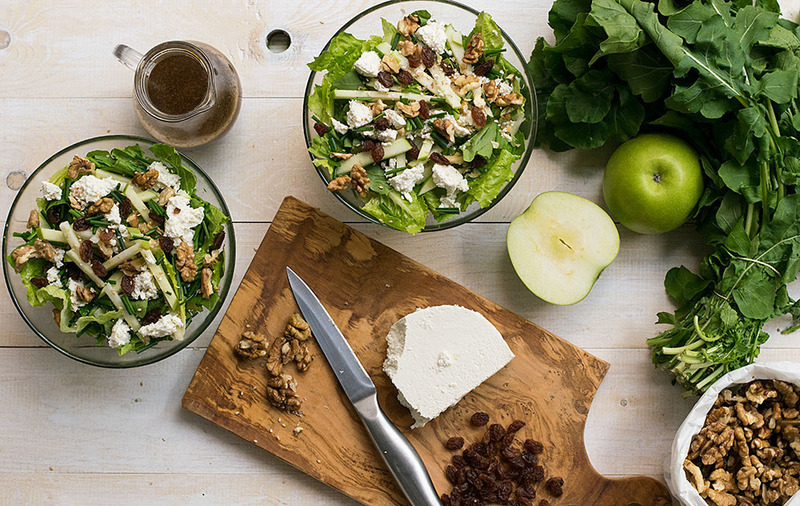 This green apple, arugula & goat cheese salad is perfect as a light lunch or as a side for dinner! This salad has a little bit of everything. 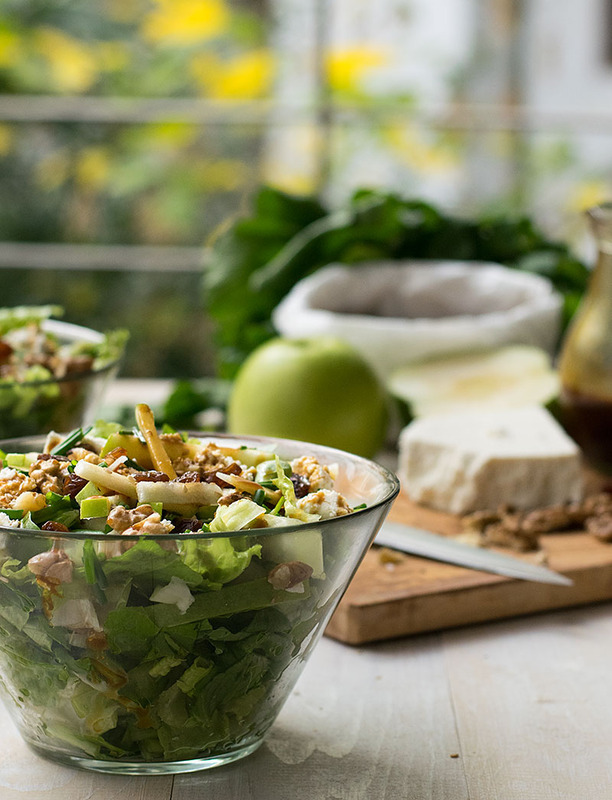 It has green leafy vegetables, it has fruits, nuts and some cheese. 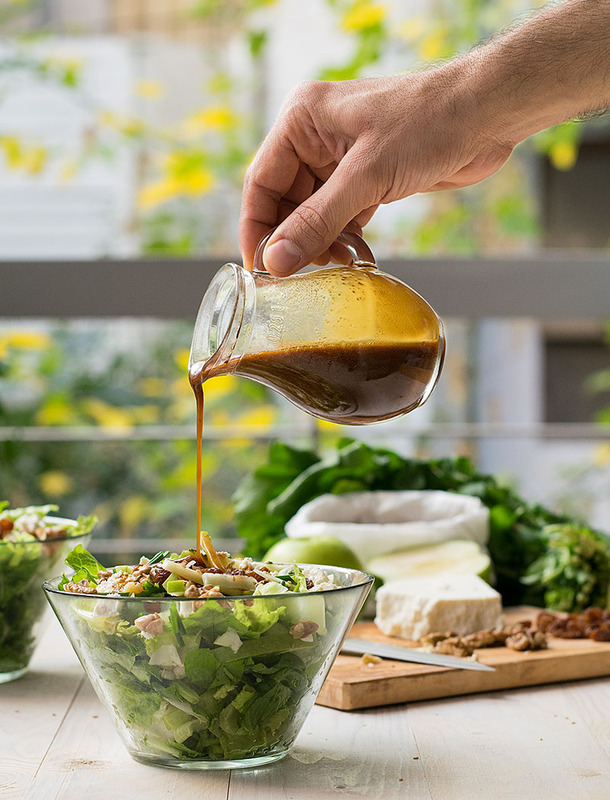 A dressing of olive oil, balsamic vinegar and a little honey helps in binding all of these great flavors together. Adding some croutons and a few pieces of roasted or boiled chicken will make it a light lunch for the office.So, I have to admit that I never count/measure how many servings of fruits and vegetables I eat daily. The paradox here is that I really like to measure things. That’s why I especially love baking. Because I get the chance to use my scale and my measuring cups and measure all of the listed ingredients with the highest precision possible! (And maybe I pretend I’m a scientist at that time.) It’s like a stress relief exercise: when I know that everything is the right quantity then I’m sure that the recipe will turn out fine. And that translates into a happy day! But when it comes to cooking my meals, I usually eyeball everything. No measuring cups, no scales no nothing. Strange, right? The only exception is when I want to write a recipe. So, in order to be sure that I consume my daily servings of fruits and veggies I try to follow a simple general rule: I eat at least two fruits a day (or two cups in case of small fruits such as cherries, strawberries, etc) and a big bowl of fresh salad. If you take into consideration that I also use some kind of veggies in my everyday cooking (check this mediterranean vegetables orzotto with orzo pasta), then there you have it. Daily intake achieved! If I had to find a negative thing to say about this dish, that would be the lack of many different colors. You see, different color vegetables provide different nutrients, beneficial for our body. 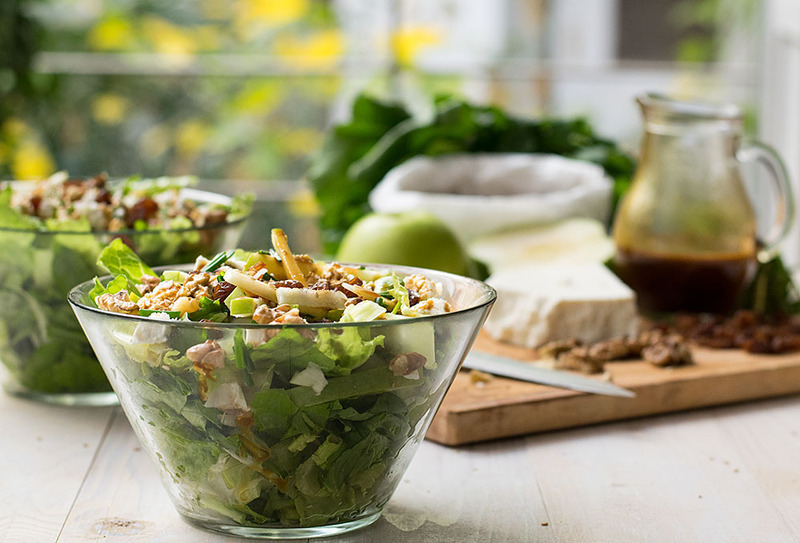 This salad is all green, with some brown tones from walnuts and raisins and creamy white spots from the cheese. To compensate, it has a lot of intense, bright flavors! Arugula offers antioxidant benefits from glucosinolates and has a detoxifying power due to certain enzymes. It’s also an excellent source of fiber, vitamins A, C (to boost the immune system), and K (for bone strength), folate, calcium, iron, magnesium, phosphorus, potassium and manganese. Lettuce is full of vitamin K and B-complex group vitamins, as well as a carotenoid called Zea-xanthin. I usually make this salad with chèvre cheese. I couldn’t find chèvre this time, so I tried some other kind of fresh cheese (and though chèvre cheese really gives this salad a special character, some good, sharp cheddar or parmesan shavings will also do the job). Eat this salad as a side with meat dishes and pasta (I totally recommend this bacon wrapped turkey roll, this deep dish chicken pie or this simple bacon tomato spaghetti). As previously noted, just add some croutons and cooked chicken for a quick and filling lunch! This salad has a little bit of everything. It has green leafy vegetables, it has fruits, nuts and some cheese. 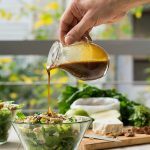 A dressing of olive oil, balsamic vinegar and a little honey helps in binding all of these great flavors together. Chop the apple into little sticks. You can leave the skin or peel it off, according to your preference. Mix the salad ingredients in a big bowl. 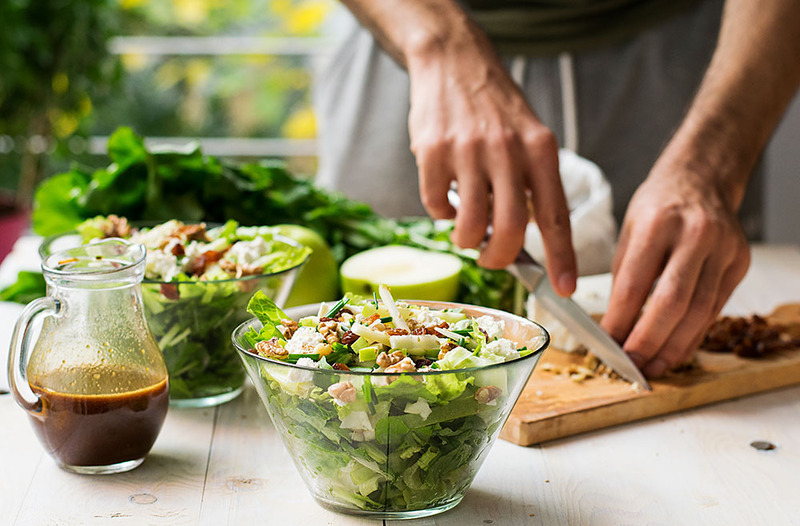 In a shaker, shake vigorously the ingredients for the dressing and drizzle it over the salad. Just add some croutons and cooked chicken for a quick and filling lunch! Thank you very much Hadia! You are very kind! I joined your board on pinterest!